Let's take a closer look at the exterior detail set, and you can click on the links above to view the other sets for this kit. This set consists of one fret of color-printed photo-etched parts. If you look closer at the image above, you can see the stitching details printed in the shoulder and lap belt straps. This set provides the complete crew restraint harnesses for both ejection seats in the OV-10D kit. You'll be threading the belts through the buckles but when you're finished, these will go right onto the ejection seats in nice poses with no need for painting. This is another nice enhancement that will be easy to install in the Kitty Hawk kit and help add additional fidelity to that nice kit. 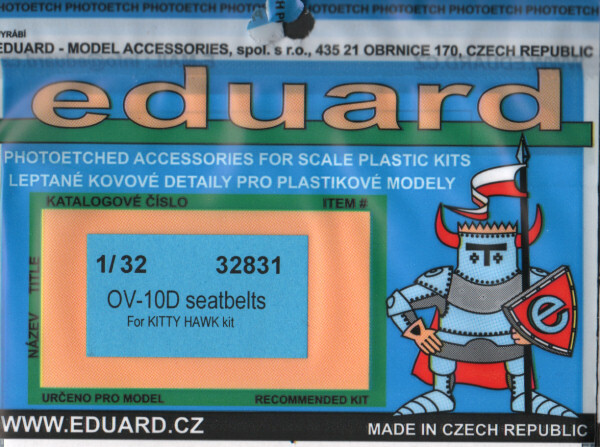 Using this set with the other releases from Eduard will raise the level of detail in this kit to a higher level. I've been waiting tackle the Kitty Hawk kit but I didn't want to start without these sets! My sincere thanks to Eduard for this review sample!